MILITARY PHOTOS A SPECIALITY ! being thrown away as in the old days. 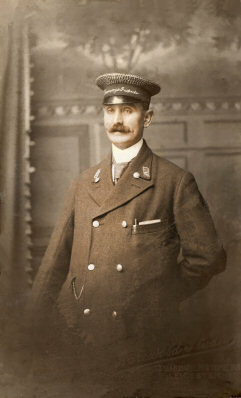 'no photo is harmed' in making any repair or digital restoration. depending on the amount of work involved. we don't take or process banking details online. Sutton & Wawne Museum inside the Old School at Sutton on Hull. 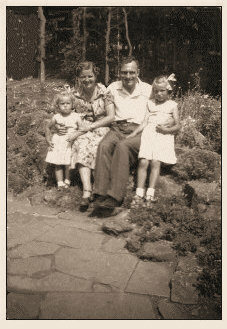 You can have your precious family photos restored like these examples, with contrast digitally improved and unsightly marks and scratches removed. Black & white photos can be made sepia, which usually improves them markedly. 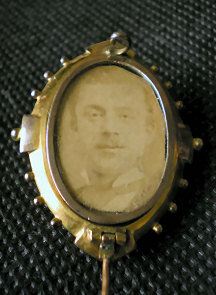 Even a tiny Victorian locket, as with this one here and no bigger than a finger nail, can have something done with it. See the larger examples of these and others below. 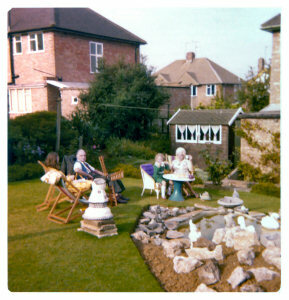 Colour photos that have faded through exposure to light can have much of the lost colour brought back. Wedding photos that were rather stark in black & white now show up more detail in sepia, such as detail of material and designs on suits and outfits previously not visible. If you have water-damaged photos, please don't thow them away until you've had an assessment to see what I might be able to do with them. Perfect restoration is not always possible, but it can often be enough to make them worth keeping for posterity and family history purposes. Some images are too precious to lose. Even ripped and competely torn photos can have something done with them, just send me both halves. The cleaner the tear, the better the result. Don't try to sellotape them yourself, and if they already have been sellotaped, send them to me as they are and I'll sort it out. Most old photos can be restored to an amazing extent, and most faults such as over or under exposure, fading owing to age, can be easily rectified. Where there are bad tears or scratches, they can be 'repaired' to a limited exent if they are over the background of the photo, but where faces have areas missing, then I'm afraid it's largely guesswork as to what was originally in there. So in the case of badly damaged faces, other than light scratches, not a great deal can be done. I can also handle slides, card or plastic mounts, even glass slides. Also negatives, either singly or in strips. If your photos do happen to be damaged beyond repair, and you still have the negs, I can put them to CD or a camera card, memory stick, etc, of your choice. Just send the media of your choice along with your material. In fact, I can put whole slide collections to your media, and tidy the images up as I go, removing spots and hairline marks, etc, as well as bringing out the colours and contrast. Several more examples and comparisons of the type of work that can be undertaken are shown below. Each example is shown at roughly 100%, or the full size it would print. Details of how you can order such improvements for your photos are below these samples, right at the bottom of this page where we also include a crib sheet to help you remember everything for us to process your order as well as advice on how to scan, or get scans done for you. This 1950s photo spent almost 40 years folded up in a purse. 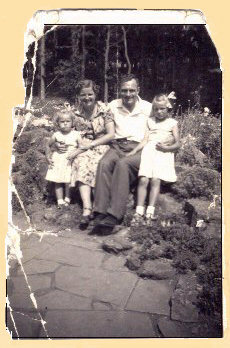 Quite badly damaged, but fortunately, no facial details of this family were missing. For those that don't intend to print the photo for hard copy, but require only digital copies for family history files, this is an ideal way to do it and include those images previously thought too poor to be worth saving. A lovely family heirloom was this Victorian locket, containing a very dull and yellowed thumbnail-sized image of a man behind a very discoloured glass. Just how handsome he was became clear after scanning it many times the original size, and then processing the image as normal. The better than expected result is only shown here at 50% size!. 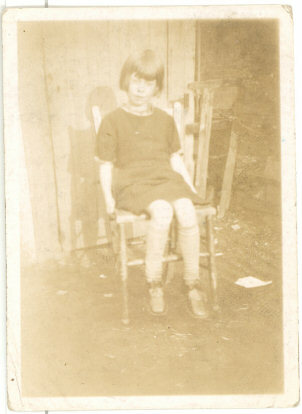 Another massively over-exposed, this photo must have been a big disappointment to this little girl's mum and dad when it was taken in 1939. I know this to be so .. for this is my own mum. 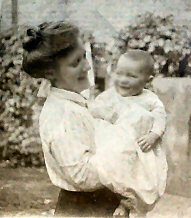 An example of how a small print, seen here around actual size, from a Box Brownie type camera can be improved and enlarged at the same time. The little girl of 9 sitting on the chair in the image above is now around 20 when this was taken some 11 years later around 1950. 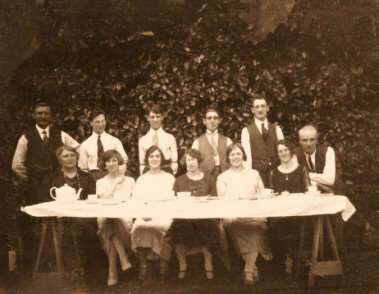 This charming photo dating from around the time just after the First World War is a typical studio photo of that time, then reproduced onto a postcard for family to send to friends and relatives, often at Christmas time to relatives abroad. 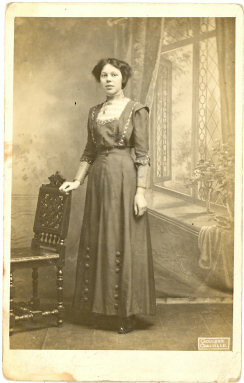 It shows very well how processing the photo can reveal detail of costume and even jewellry not suspected before. 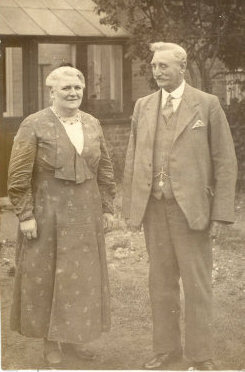 In some cases, peices can be more easily identified for family history purposes. 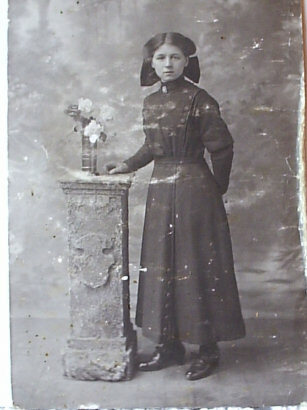 Another one in the same vein, from about 1911, but this young lady was much more badly marked as well as being faded and overexposed. The marks have been largely removed, and the border reformed and defined as well as adding a decorative edging. 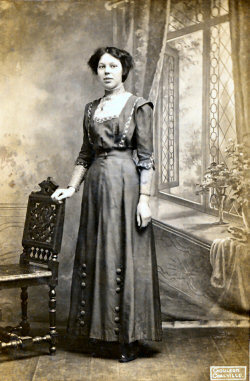 The improved contrast shows well in the girl's dress and her facial features. 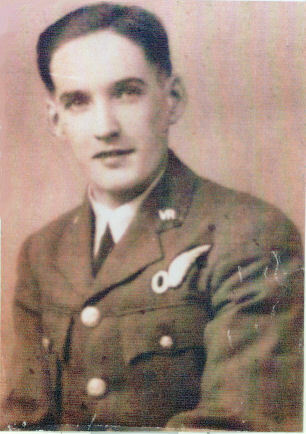 A good example of a photo that really only needed the contrast improved, perhaps taken for this man's retirement, where a studio photographer would be invited to the home. 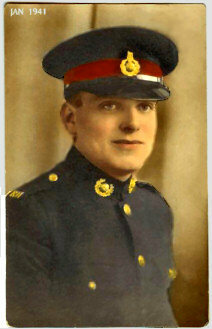 Taken around 1945, just at the end of the Second War. Dress patterns, watch chains, all come up wonderfully well with some judicious processing. 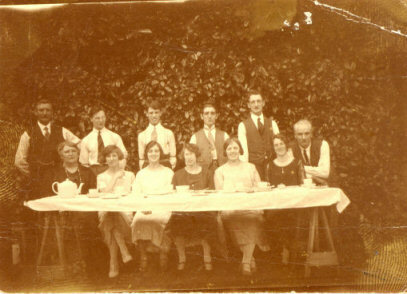 A classic family group photo, from the 1930s, damaged at the corners, showing quite a few scratches, and an intrusive deep orangy colour. 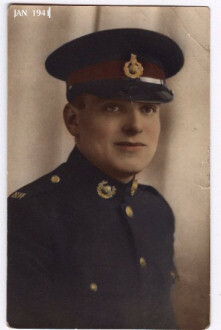 Military and uniform photos can be especially satisfying to improve, and often show up previously unrealised badges of rank, regimental insignia, decorations and other details. Any extraneous marks can be removed, such as numbers, or ink or pen marks that may have been someone's indication of where their forefather stood, as was the case here. The man outlined on the far right had originally been marked with a large arrow in pen ink, all now removed. 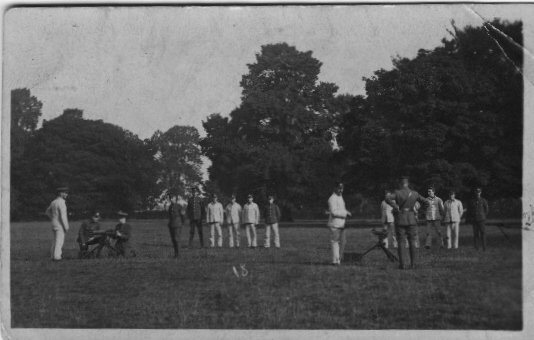 In this photo of 1914, right at the start of the First War, these men are training to be machine gunners. Experts may even be able to now tell what make of machine gun is shown here. 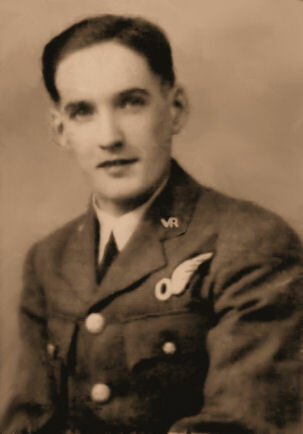 taken in a studio in 1941. Being from an RAF service family, and having had links with the Royal Navy as well as the army, I especially like to do military photos. I'm familiar with and understand service protocols with regard to uniforms, badges of rank, decorations and awards. 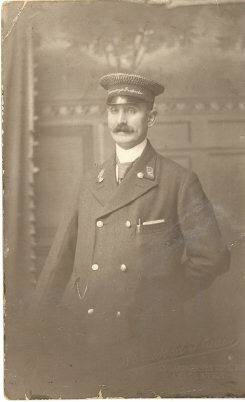 Here, we have an over-exposed studio portrait of the 1930s of a tram inspector, that has been restored for contrast, had the edges and corners tidied up, and then very lightly colour tinted. Photo tinting was all the rage over 50 years ago, before colour film became more affordable, and many people bought the tints and did the job themselves. Here, it can be done very carefully digitally, with excellent results. And for our final examples, we show the restoration of faded colours. 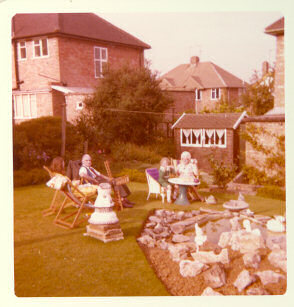 Do you have any of those classic Kodak Instamatic photos of the 1970s where colours have faded. In this case, the blue and green inks in the printing turned out to be fugitive, and have almost disappeared, leaving almost every photo of that era with a reddish-orange glow. I can restore them, as seen here, to almost their former glory. Again, it can be done digitally, including removal of those annoying thousands of tiny white spots on that era's canvas-effect prints that only show up with scanning. with unwanted items requested to be taken out. Click the image to see what items were removed. 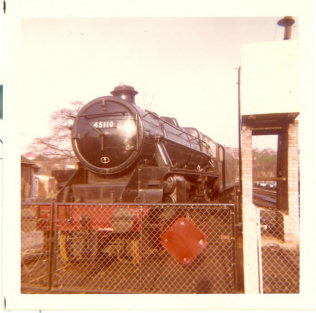 This was taken in the autumn of 1971, nearly 40 years ago. Over time, the colour has likewise gone more and more .... pink! What a fate for such an exalted loco! But ... hey presto, as good as new. In most cases, even background detail can be improved and brought back to life, and when scanned and shown full-screen on a monitor or TV, say via a CD, DVD or USB flash key, the results can be positively stunning. 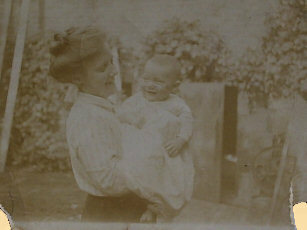 Photos that were previously thought to be irrevocably spoiled, including water damage, can at least be made to be worth saving for posterity and family history. These two large sporting team photos from the world of rugby league were recently restored to something more like their former glory. 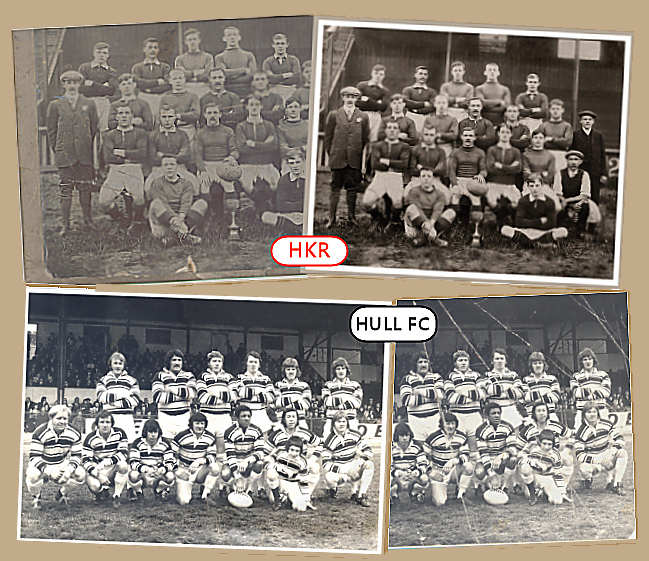 The HKR photo dates from 1910, and is of the reserve team of that time. The Hull FC photo dates from the late 1960s and was in even worse condition, being in three pieces by the time the 50 year old sellotape had been removed from the front. Luckily, it was so old and dry it came off easily without lifting any of the image. I retacked it lightly on the back to hold it together in the scanner. The rest was just fine restoration, mainly done with a pen-tablet. It can be done with a mouse, the earlier ones above were mostly done that way, but a tablet makes the job quicker, as well as for finer work. Both images are shown much reduced , about 20% of real size, so are not very clear here. The final results were just larger than A4, and the result very fine indeed, just as the originals would have been, but minus the scratches, creases, spots and blots and other extraneous marks old photos seem to pick up over the passage of time. There are a couple of points worth remembering if you decide to scan your photo yourself. Your scanner will scan at its default settings unless you alter them yourself. In most cases, default settings will not give good results for repairs. If you've not done so before, now may be a good time to experiment and have a go. 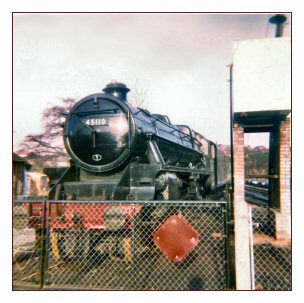 Firstly, make it at least full size, ie, choose at least 100% in the size requester for a 7x5 image. Scan it double size, 200%, if you can, to allow me to give a much better result. In effect, scanning an image double size is the modern digital way simply to enlarge it. Also, the scan resolution is very important too. Scan at a minimum resolution of 300dpi (dots per inch), for basic results, and for smaller photos, like little Box Brownie prints, scanning at 300% and 600dpi is good. A tiny print, scanned at double or treble size and at 600dpi gives me the best chance for a surprising result. Then send it to me by email, attaching it in just the same way as you would a family photo to a friend, etc. Don't worry about it being a very large file size, my email will handle it. Anything up to 20Mb should be fine for me to receive. Much depends on whether your server allows files that big. I will acknowledge by email that I have received it okay, and give you an immediate opinion as to whether I can do anything with it, to what extent it may be repaired or improved, and how much it may cost. 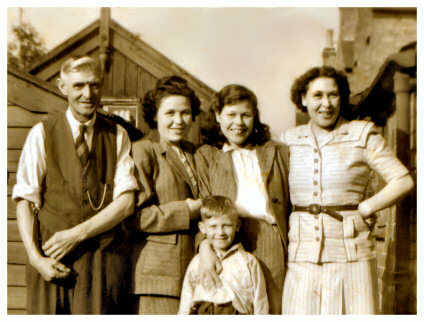 If you decide to go ahead, I will attempt to restore or revitalise your photo, and then email it back to you so that you can choose how and where to print it. You may decide to print it yourself, or take it on a CD or flash key to a photo processors just like with a digital camera card. Alternatively, you could have your photo/s transferred onto a CD, DVD, or send me your choice of flash key / memory stick, along with the photo/s, and I'll put it on there. I would email you proof copies first so that you can by satisfied by the results and see what you're paying for. but proportionately less for more. Typically, £5 would include improving contrast, repairing corners, removing bad scratches or tears, reforming any border, a certain amount of 'despeckling' and removing any obtrusive spots or stains. Naturally, it is time-consuming, so larger photos or more detailed fine work would cost more. I take payment by sterling cheque, postal order, direct bank transfer, or cash by arrangement. or pay by a direct BACS donation to the Sutton & Wawne Museum .. my preferred option. Details supplied. Ideally, scan them and attach in an email, sending one at a time if you prefer. Please be sure to include in your email your full details, ie, name, address, contact phone number, and any special remarks or comments, such as you would like them tinted, or b&w made into sepia, etc. Naturally, if you want me to scan them, that will be reflected in the final cost. I've placed a 'memory checker crib list' at the bottom of this page for you to copy and paste if it's of any help to you. If you're not in a position to scan and would rather send items by post, it may be best to photograph them with a digital camera for yourself anyway, as a safeguard against the vagaries of the Royal Mail. Another ideal way is to take your image/s into your local Print Shop, and tell them what you want to do. Ask them to scan at least 200%, (300% is better for Box Brownie prints, and 600% for lockets), at a resolution of 300 or better. They'll put your photos onto a CD for you and then send me the CD. 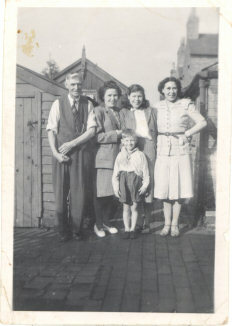 I'll put your restored photos onto another CD and send that back to you along with your original CD. I can work with a digital photo of your image if it's good and sharp and clear enough. Stand the photo up against a book on a table, and keep the camera on something solid, like another book. Use a macro setting to get in close. Press the shutter very gently. Take some practice ones and delete the ones you're not happy with. Remember to use natural daylight, avoid flash and remember that most photos are reflective so position them where they won't be marred by a reflection of the camera itself or even something behind it. I can also take negatives that you may have in your collection where the print is missing, or re-process negs where the print is lost or damaged beyond repair. But a well-scanned image is easier in the long run, and you don't have to let the original out of your sight. 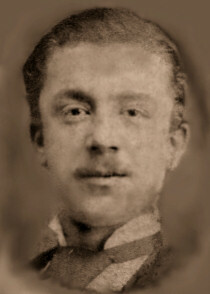 I've recently scanned and improved the tiniest image found in a family Victorian locket. I scanned it at 600% ... six times its real size, and the improvement and detail that came out surprised even myself. If you wish, place each item in a separate envelope or paper within the larger envelope and write your name and address on it. If an image is not already mounted on stiff card, a piece of stiff card cut to size and inserted in the envelope will help enormously to keep the whole packet rigid. 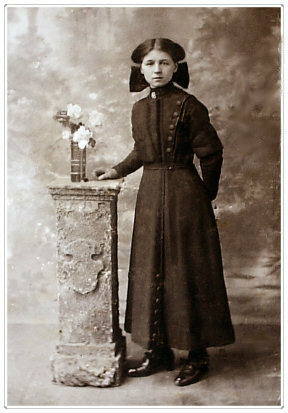 I know it's not always possible to write on the back of a photo, either because there isn't room or there are historic details that shouldn't be defaced, ie with a postcard or family portrait made as a postcard. When I receive them, I will either email or telephone you to confirm I have them, and what was in the packet, and to further discuss your requirements. It may also help if you indicate in your letter what may be the best time for me to call, and of course, not forgetting your telephone number. But in the first instance, please do just email me, rather than sending your material blind. It's always good to talk. I look forward to hearing from you, and surprising you by what can be done with precious images thought lost or beyond repair. Email me for our postal address and other details of how to pay.